Amenhotep II (sometimes read as Amenophis II and meaning Amun is Satisfied) was the seventh Pharaoh of the 18th dynasty of Egypt. Amenhotep inherited a vast kingdom from his father Thutmose III, and held it by means of a few military campaigns in Syria; however, he fought much less than his father, and his reign saw the effective cessation of hostilities between Egypt and Mitanni, the major kingdoms vying for power in Syria. His reign is usually dated from 1427 to 1400 BC. Amenhotep II was the son of Thutmose III and a minor wife of the king: Merytre-Hatshepsut. He was not, however, the firstborn son of this pharaoh; his elder brother Amenemhat, the son of the great king's chief wife Satiah, was originally the intended heir to the throne since Amenemhat was designated the 'king's eldest son" and overseer of the cattle of Amun in Year 24 of Thutmose's reign. However, between Years 24 and 35 of Thutmose III, both queen Satiah and prince Amenemhat died, which prompted the pharaoh to marry the non-royal Merytre-Hatshepsut. She would bear Thutmose III a number of children including the future Amenhotep II. 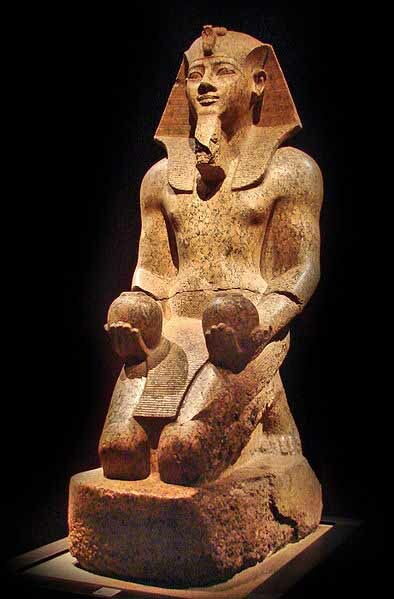 Amenhotep II was born and raised in Memphis in the north, instead of in Thebes, the traditional capital. While a prince, he oversaw deliveries of wood sent to the dockyard of Peru-nufe in Memphis, and was made the Setem, the high priest over Lower Egypt. Amenhotep has left several inscriptions touting his athletic skills while he was a leader of the army before his crowning. Amenhotep was no less athletic than his powerful father. He claims to have been able to shoot an arrow through a copper target one palm thick, and that he was able to row his ship faster and farther than two hundred members of the navy could row theirs. Accordingly some skepticism concerning the truth of his claims has been expressed among Egyptologists. Amenhotep acceded to the throne on the first day of the fourth month of Akhet, but his father died on the thirtieth day of the third month of Peret. If an Egyptian crown prince was proclaimed king but did not take the throne on the day after his father's death, it meant that he served as the junior coregent during his father's reign. A coregency with Thutmose III and Amenhotep II is believed to have lasted for two years and four months. "Now his Majesty appeared as king as a fine youth after he had become 'well developed', and had completed eighteen years in his strength and bravery." After becoming pharaoh, Amenhotep married a woman of uncertain parentage named Tiaa. As many as ten sons and one daughter have been attributed to him. Amenhotep's most important son was Thutmose IV, who succeeded him; however, there is significant evidence for him having many more children. Princes Amenhotep, Webensenu, Amenemopet, and Nedjem are all clearly attested, and Amenemhat, Khaemwaset, and Aakheperure as well as a daughter, Iaret, are also possible children. Papyrus B.M. 10056, which dates to sometime after Amenhotep II's tenth year, refers to a king's son and setem-priest Amenhotep. This Amenhotep might also be attested in a stele from Amenhotep II's temple at Giza, however the stele's name has been defaced so that positive identification is impossible. Stele B may belong to another son, Webensenu. Webensenu's name is otherwise attested on a statue of Amenhotep's chief architect, Minmose, and his canopic jars and a funerary statue have been found in Amenhotep II's tomb. Another Giza stele, stele C, records the name of a Prince Amenemopet, whose name is otherwise unattested. The same statue with the name Webensenu on it is also inscribed with the name of prince Nedjem, who is otherwise unattested. There are other references to king's sons from this period who may or may not be sons of Amenhotep II. Two graffiti from Sahel mention a king's son and stable master named Khaemwaset, but specifically which king is his father is unknown. A figure with the name Amenemhet is recorded behind a prince Amenhotep in Theban tomb 64, and assuming this Amenhotep is indeed the king's son from B.M. 10056, Amenemhat would also be Amenhotep II's son. Additionally, a prince Aakheperure is mentioned in a Konosso graffito alongside a prince Amenhotep, and if one again assumes that this Amenhotep was the same person as the one in B.M. 10056, Aakheperure would also have been Amenhotep II's son. However, in both these cases the figure identified as Amenhotep has been identified by some as possible references to the later King Amenhotep III, which would make these two princes sons Thutmose IV. In addition to sons, Amenhotep II may have had a daughter named Iaret, but she could have also been the daughter of Thutmose IV. Two more sons had been attributed to Amenhotep II in the past, however, they have since been proven to be of other parentage. Gauthier catalogued one Usersatet, the "King's son of Kush," (i.e. 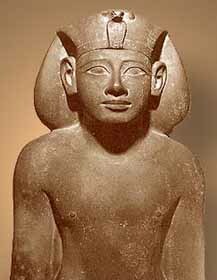 Viceroy of Nubia) as a son of Amenhotep II, as well as one Re, however, both are now known to be unrelated to the royal family. Usersatet merely served as Amenhotep's chief official in Nubia and was not a blood relative of the king. Amenhotep's coronation can be dated without much difficulty because of a number of lunar dates in the reign of his father, Thutmose III. These sightings limit the date of Thutmose's accession to either 1504 or 1479 BC. Thutmose died after 54 years of reign, at which time Amenhotep would have acceded to the throne. Amenhotep's short coregency with his father would then move his accession two years and four months earlier, dating his accession to either 1427 BC in the low chronology, or in 1454 BC in the high chronology. The length of his reign is indicated by a wine jar inscribed with the king's prenomen found in Amenhotep II's funerary temple at Thebes; it is dated to this king's highest known date - his Year 26 - and lists the name of the pharaoh's vintner, Panehsy. Mortuary temples were generally not stocked until the king died or was near death; therefore, Amenhotep could not have lived much later beyond his 26th year. There are alternate theories which attempt to assign him a reign of up to 35 years, which is the absolute maximum length he could have reigned. In this chronology, he reigned from 1454 to 1419. However, there are problems facing these theories which cannot be resolved. In particular, this would mean Amenhotep died when he was 52, but an X-ray analysis of his mummy has shown him to have been about 40 when he died. Accordingly, Amenhotep II is usually given a reign of 26 years and said to have reigned from 1427 to 1401 BC.